Planning a little off-road adventure will be easy with this trailer in tow! Model NB16.7 offers the added ground clearance you need when the standard campground just won't do! You are sure to love this rear kitchen layout when making meals, and the wet bath to keep you clean and comfortable no matter where you are camped. 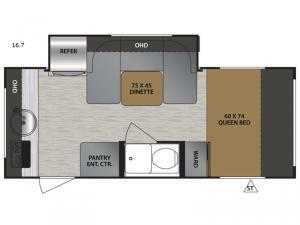 You will find seating and sleeping space for two on the queen bed to four campers if using the U-shaped dinette. An optional TV can be added for late night enjoyment, or when you are hanging out inside on a day where the weather isn't very nice!